This isn't a perfect panel by any means, but it boasts more plus points than downsides, and sports a tempting price tag for a 4K monitor. Hannspree is one of the very few remaining Taiwanese display companies left. Alongside the likes of BenQ, AG Neovo, Acer and ViewSonic, they have had to fend off increasing competition from the likes of TP Vision (AOC, Philips), Samsung, LG and Japanese rivals (Ilyama, NEC and Eizo). This has caused diversification to be seen as an essential aspect of Hannspree's business plans, with mixed results. The company has dabbled in tablets, PCs, wearables, speakers and even smartphones, but these lines of business remained on the periphery. At any rate, today we're looking at Hannspree's latest 4K monitor, the HannsG HU282PPS with a price tag of just under £290 (around $380, AU$510) at Ebuyer. That's about a tenner more expensive than the AOC U2879VF, the cheapest 4K monitor on the market, with a 27/28-inch diagonal. At techradar pro, we're adamant that moving to a 4K monitor is one of the best upgrades that any business or professional can make to improve their workflow. On paper, it looks like a pretty compelling offering: you get two rear-facing 3W speakers, a DisplayPort, two HDMI ports, a DVI one, audio in/out ports, a VESA mount and a rated brightness/contrast of 280cd/m2 and 1000:1 respectively. One HDMI port is a version 2.0 affair according to the manufacturer, and this means that it should be able to do 4K at 60Hz. Hannspree also claims that the monitor consumes up to 38W in use and 500mW on standby. The rest of the specification sheet reads as follows: a 5ms response time, a 0.15 x 0.16mm pixel pitch, and viewing angles of 170/160 degrees. Interestingly, the monitor sports toughened glass which claims to be anti-glare – such a feature is usually associated with touchscreen functionality, but this is not even an option on this model. Out of the box, the monitor comes with a power cable, a DVI cable and a pair of audio ones, plus a flat metal plate that can be screwed to the chrome stand. The on-screen display (OSD) settings are basic to say the least, with the sort of options you'd expect to see on most monitors, allowing users to tweak the image to their working environment. We liked the design of the plate as it allows you to get extra real-estate on your desk, while the four ports allow you to use the latest devices as well as legacy ones that might have a VGA or a DVI connection. You can only tilt the stand (up and down) as it doesn't allow pivoting. With its large black bezel and a dash of silver plastic, this monitor does look a bit like an Apple iMac. Maybe Hannspree is missing a trick here. 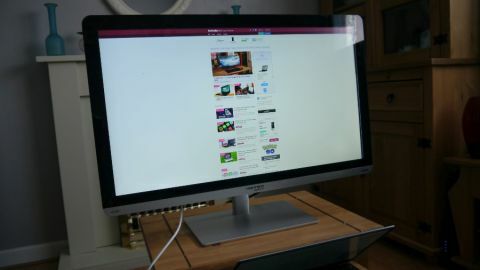 We tested the monitor using a Dell XPS 13 laptop with a Mini DisplayPort. The HU282PPS was automatically recognised and ran in 4K at 60Hz without any noticeable hitch – we didn't test the other ports which meant that we couldn't confirm if it can do picture-in-picture (Ed: Hannspree confirmed that you can't). In a brightly lit room, there is a significant amount of glare especially when it comes to darker or black areas. But on a more positive note, it does make for a particularly useful large format mirror when switched off (ahem). The speakers are louder and clearer than we were expecting with no noticeable buzz or audio glitches, and you can connect an earphone or an external source to the monitor. The HU282PPS uses a TN panel rather than an IPS one, which means that it suffers from relatively poor viewing angles, which in real life translates to colour shifts if you move your head in a sideways direction. Also, the thick slab of glass compounds this problem making things slightly worse. When sat dead in front of the monitor though, the viewing experience was better with adequately rendered content (moving or fixed). You can always tinker with the settings which are accessible via a row of five buttons located on the bottom edge of the monitor. You can swap the display colour temperature from warm to cool and there are six pre-programmed video modes to cater for most user needs. If you don't plan on using it in a bright and sunny environment (next to a window for example), you will get used to the glass slab that covers this display. The Hannspree HU282PPS does have quirks but it is by no means a bad product; when it comes to 4K monitors, we've seen worse. At least this one has an HDMI 2.0 and a DisplayPort, allowing you to connect two 4K sources. Having two other inputs capable of full HD means that you will be able to hook up legacy devices as well. If you are after a decent 4K monitor for less than £300, it is a toss-up between AOC and this HannsG as they share similar features (bar FreeSync on the AOC). We're getting the former in for a hands on review soon, so will update this article in due course.